There are important differences in the way we offer newborn screening tests for babies in special care baby units. We have explai ned these differences in a new 8-page leaflet, Babies in special care units: screening tests for your baby, which is available for screening providers to order now and for free. 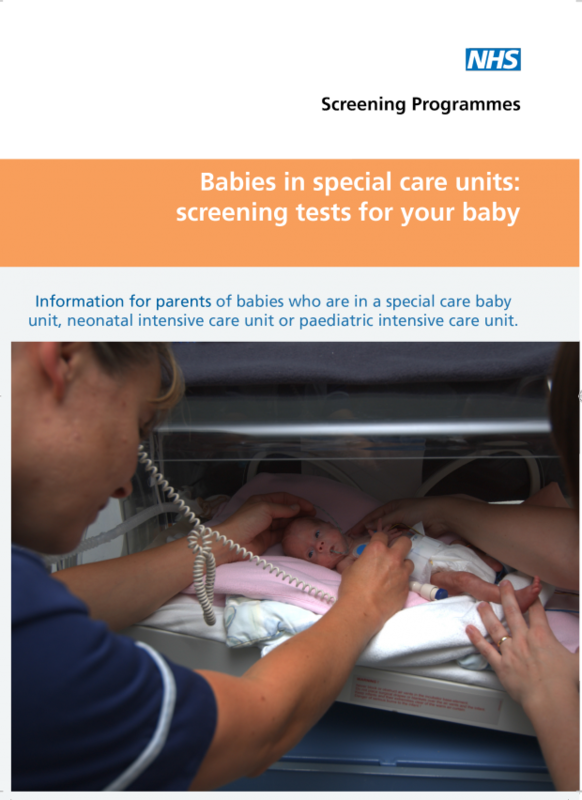 You should use the new leaflet alongside the standard Screening tests for you and your baby booklet when giving information to parents of babies in special care units. The new leaflet replaces the previous publications, Your Baby's Hearing Screening Test and Blood spot for premature or NICU babies, and includes all the important differences in newborn hearing, newborn blood spot and newborn and infant physical examination screening for babies in special care units. It also includes information on differences in follow-on care for premature babies after infectious diseases in pregnancy screening. You should order enough leaflets to give to all parents of babies being looked after in a special care baby unit, neonatal intensive care unit or paediatric intensive care unit. Special care units will need to liaise with colleagues across screening to ensure you have enough stock. Download the new leaflet or find out how to order it on GOV.UK.